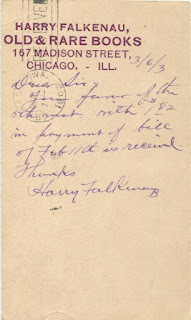 Bibliophile and antiquarian are but two words to describe Harry Falkenau (1864-1907) of Chicago. And he was quite accomplished at both, as well as oration, but his real passion was music. 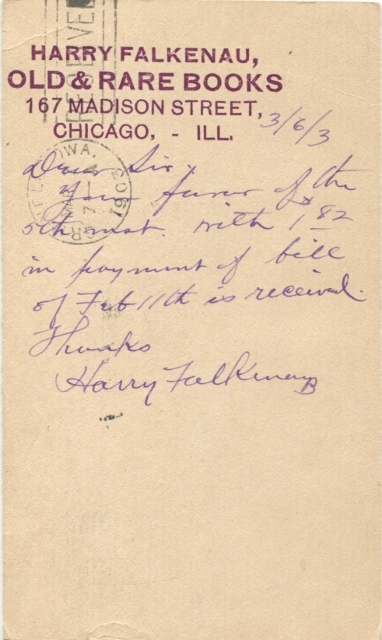 This 1903 postal card, however, introduced me to Harry the bookseller and his penchant for rare books as both collector and dealer. 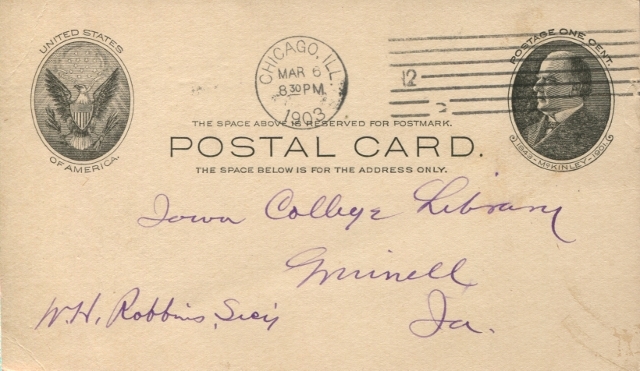 The postal card here served as a business communication, or receipt, to Iowa College Library in Grinnell, Iowa, acknowledging receipt of payment for an unnamed book. 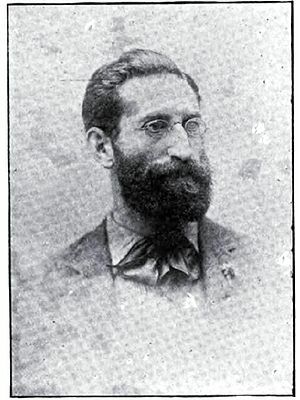 Falkenau gained some notoriety as a Cornell University student when he defended Walt Whitman's Leaves of Grass against obscenity charges in 1882. A gifted orator, Falkenau was selected three years later to deliver a commencement speech at Cornell and Whitman surfaced again. His speech was titled, The Poetry of the Future as Foreshadowed in the Writings of Walt Whitman. He also composed music and played violin and pianoforte. He was a member of the Irving Literary Society (a regular venue for his musical performances), a Fellow in Literature for a year after graduation in 1885, and worked as an Assistant Librarian. He could play Chopin's Nocturne and teach Chaucer and Shakespeare, both of which he did his last year at Cornell. His love of music and literature created a natural career path, first as a drama critic in San Francisco and later for the Chicago Herald. It's uncertain what prompted him to transition from music into books at that time in his life. Perhaps he was burned out with writing and needed a change of scenery. Whatever the case, it was likely a natural progression given his background and tastes. 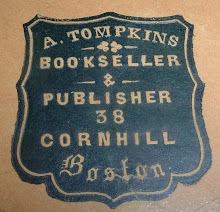 He bought an antiquarian book shop in Chicago at 46 Madison Street. 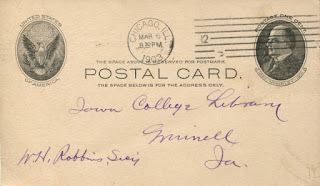 The 167 Madison Street address indicated in his stamp on the McKinley Postal card was his second shop, where he apparently dealt in rare books the rest of his brief life. He died at age 43. During his tenure as an antiquarian bookseller, Falkenau left little in the way of content for future Internet searchers a century later. There is a decent Wikipedia page, which supplied much of the above information and there is the postal card now in my collection that corroborates his business address and nature of his stock. Little else was found during my searches, other than newspaper mentions, until I stumbled across an old newspaper article that featured him as a bookman. So Harry Falkenau was part of a queer class (anachronistically speaking) of Chicago men who knew first editions and lived in their books! 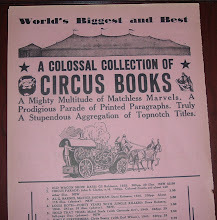 This 1897 article published in the Inter Ocean, an old Chicago newspaper, begins with a harsh admonishment of book buyers who have little or no interest in a second-hand shop that deals in rare books: "The ordinary, uneducated, ignorant, unintelligent, and ignoble man regards a second-hand bookstore with as much lack of interest as a bicycle rider does a blacksmith shop." These poor souls who are satisfied with an “eighteenth edition or two hundred and fiftieth thousand” printing of a book unknowingly advertise themselves as “philistine and shoddy.” How’s that for a snooty attitude toward the general public of book buyers? The unnamed reporter who wrote this article didn't have to go far for his story. Falkenau's shop was in the Inter Ocean building. The reporter quoted Falkenau as having claimed to possess the largest stock of its kind in the West and then wrote that Falkenau “fed an eager, aspiring reporter with many facts about the business yesterday.” I take this to mean that the above characterization of the man on the street who doesn’t know squat about books comes from the mouth of Harry Falkenau himself, unless the eager, aspiring reporter exercised some literary license with what he heard. Much of what follows in this article is Falkenau's musings and grumblings about the rare and used books trade and how business is conducted. Interestingly enough, a lot of what he has to say still holds true for dealers in the trade today. To engage in this business needs a peculiarly constituted man. It is an art rather than a business. A second-hand bookseller must know every one of his large stock as well as a horse trainer knows his horses. The stock kept has to be immense, because there is no regular place where stock can be replenished. He must buy his stock when it is offered to him, and then he must wait until the man comes along who wants the particular books. There is a saying among second-hand book dealers that there is “a man for every book in the world,” just as there the right man for every woman, but to bring the two together is as difficult to bring the right man and woman together. Thus it happens in the book trade that there are many divorces, and many books that languish in single loneliness. It is interesting, however. There being no fixed prices for old books—so much depending on condition, etc.—the gambling element enters largely into it. The hunters’ instincts are also appealed to. As an instance, a man picked up an original edition of Tamerlane from a lot of rubbish for 10 cents and sold it the next day for $1,800 . You are on the hunt all the time, and you can never tell in what odd corner you may come upon your quarry. Most of the books are got through the sale of libraries. These are sold through the death of the owner, through poverty, through moving away. Books cannot be compressed, or lessened in weight. And they damage considerably through moving. The carefully selected library of the father falls to the son of sporting proclivities, and to him they simply waste room. These the book dealer gets hold of and puts again into circulation among those who appreciate the gift of the gods. The old book dealer begins generally, as Mr. Falkenau did, by being a collector. When he goes into the business, he gives up collecting, because he then realizes the immensity of his undertaking, and the impossibility of ever even approximately realizing it. Collecting old books is like seeking the everlasting fountain of youth, or the philosopher’s stone, and the only ones who are ever cured of the mania are those who turn dealer. Others, especially if it takes the turn of collecting first editions, keep on, ever hopeful, till their death. That is one of the mitigations of the disease; as in consumption, the patient is cheerful till the last. The article goes on to talk about the bane of booksellers everywhere--the book thief. On this topic, Falkenau has much to say, as reported in the article. Thieves are especially hurtfully, he reports, to booksellers who regard their books almost as friends. Stealing a treasured friend goes beyond hurtful, it is insulting. Falkenau appears to view practitioners of his trade as tender-hearted and vulnerable to anyone who shows the slightest interest in his first editions, original imprints, etc. 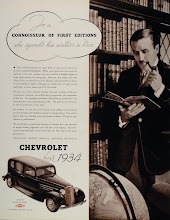 Even though a dealer may suspect a book thief in his midst, he cannot resist showing his treasure because "who knows but that his heart will be turned by books, even as men have been won by women--far less fascinating than books." One last observance from Mr. Falkenau on how he interprets what outsiders see when looking in at the bookseller and what he thinks of booksellers. Common people think of book-sellers as isolated hermits, who live in a miraculous manner by the grace of God for denying themselves from the world and for burying themselves in dry but worthy occupation. But old book men regard themselves as the aristocrats of the business world. They form a guild of their own, and through their paper, keep in touch with one another all the world over; in touch in a mercantile and in an intellectual way. 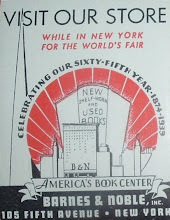 Obviously, Harry Falkenau had a passion for books and for his trade. He had a passion for music. What was missing? Something... With all the contentment he seemed to have in his life, it was a surprise to learn of his suicide in the newspaper report below. He was "despondent" (blamed on insomnia) and had retired to a fruit farm in Michigan to live and hopefully get the rest he so badly needed. It wasn't enough. A family friend provides insight in the obituary as to what his family life was like. He evidently hid his depression very well. Perhaps a closer inspection of the Inter Ocean reporter's article on Falkenau will provide some clues as to an underlying mental illness.